At the end of 2017, I wrote about the death of Buzz the beehive due to a wax moth infestation. 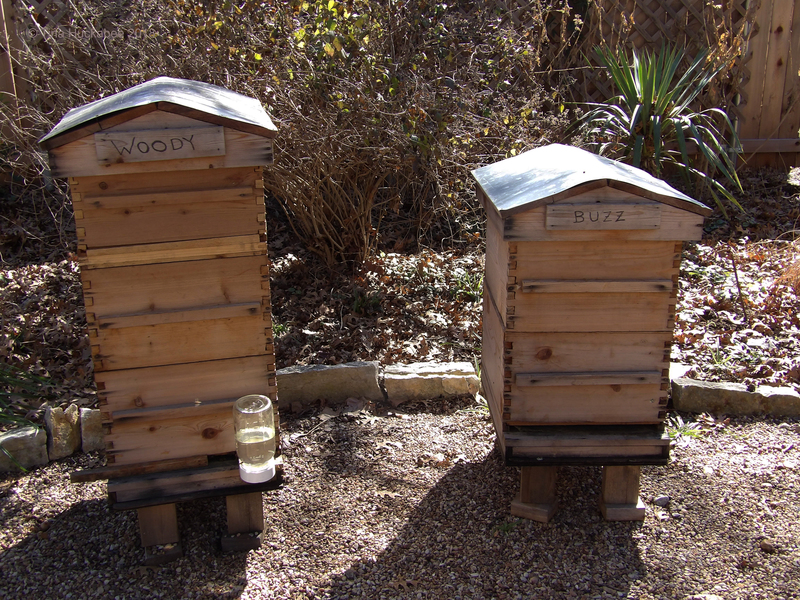 We have plans to re-hive Buzz in April, but winter projects on my to-do list include moving both Buzz and Woody about 10 feet from where each originally stood, and to finish cleaning and disinfecting Buzz from the yucky remains of the wax moth infestation. I’m pleased to say that I’ve achieved both goals, well ahead of the April re-hiving date! 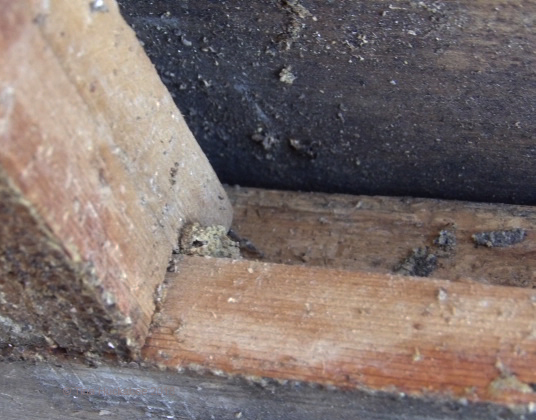 When we discovered the invasion of wax moths, we removed the offending invaders and most of their accoutrements, therefore the ick of infestation remaining in Buzz consisted primarily of webbing, some frass (okay, lots of frass), and a few possible larvae cocoons. All laid out on the back patio, ready for the cleaning. Webbing from the moth larvae, with frass in the mix. The dark spots are frass. One sneaky cocoon left over from the initial elimination of the insects and their remains. I thoroughly vacuumed each box and all section pieces of Buzz, and then with brush, gloves, and bleach water in hand, proceeded to scrub-a-dub-dub the inside parts of the hive. 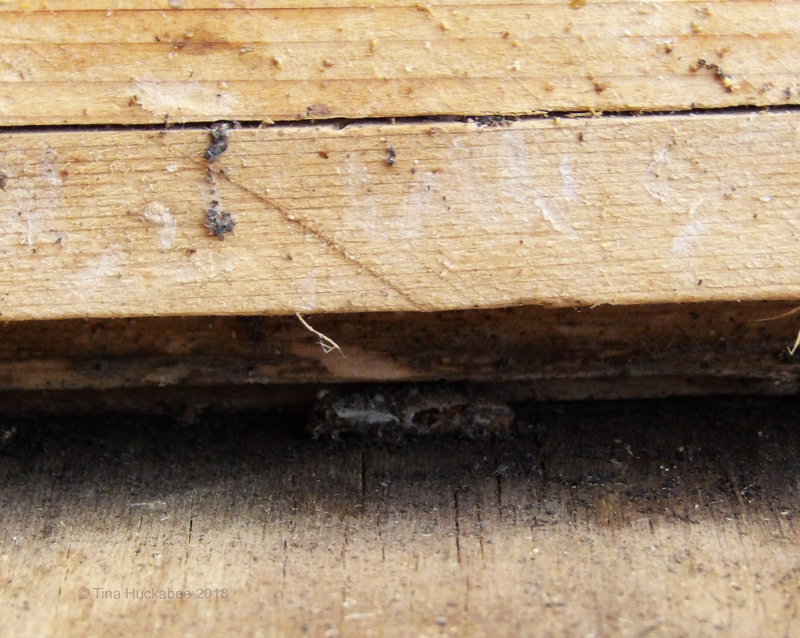 In some spots, I used a utility knife to clean out narrow gaps and remove the remains of cocoons. I certainly don’t want any cocoon hanging around, awaiting release from dormancy for the purpose of reinfection. If the new hive is strong–which it will most likely be–a re-infestation is unlikely, but just to be on the safe side…. 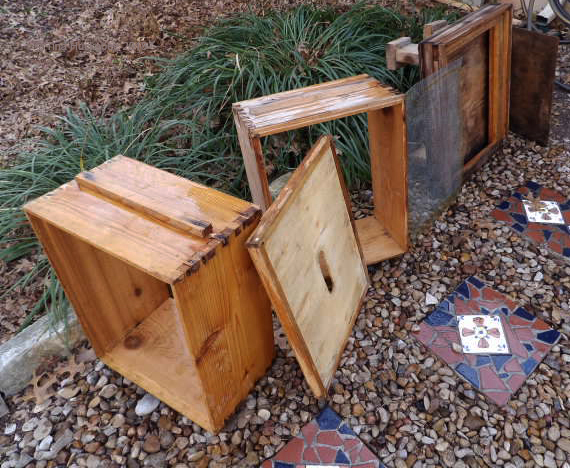 After rinsing the entirety of Buzz with fresh water, I left the dismantled hive out for a few days in the cold to dry out. 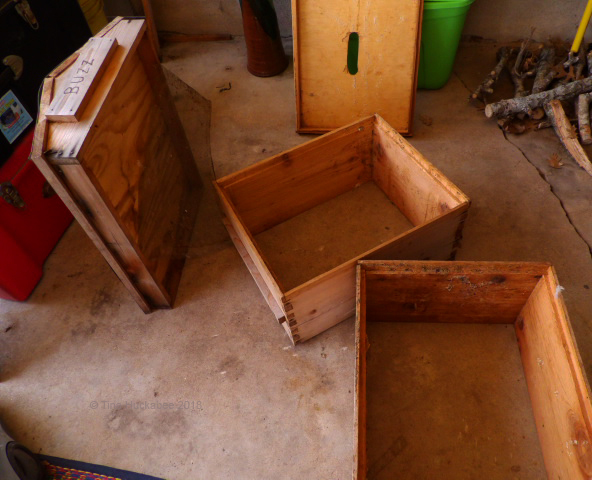 The parts shown, left to right: brood box, top lid, another brood box, mesh, base, bottom board. 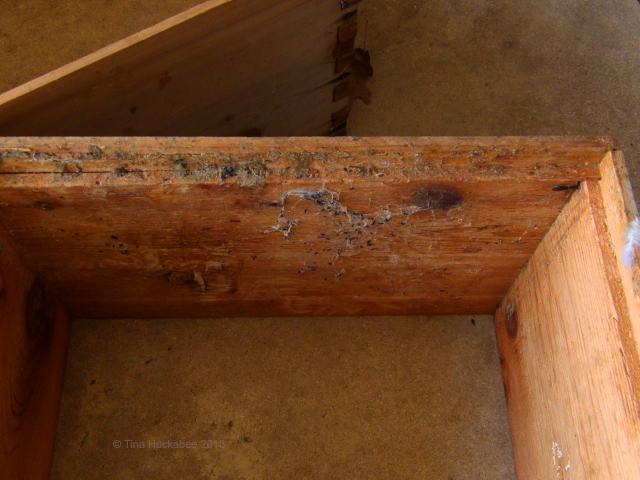 There are no frames because we destroyed and trashed them–the frames were too infected with wax moth nastiness and not salvageable. Meanwhile, we moved Woody to her new spot in the garden, and placed a marker right next door for Buzz–for when she’s ready. You’ll notice a bottle of sugar-water on Woody’s bottom board. 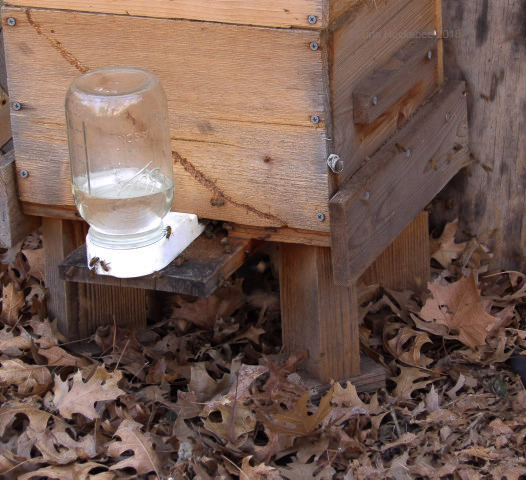 The bees are foraging on warmer days, but during this time of winter honeybees are at their greatest risk of starvation. 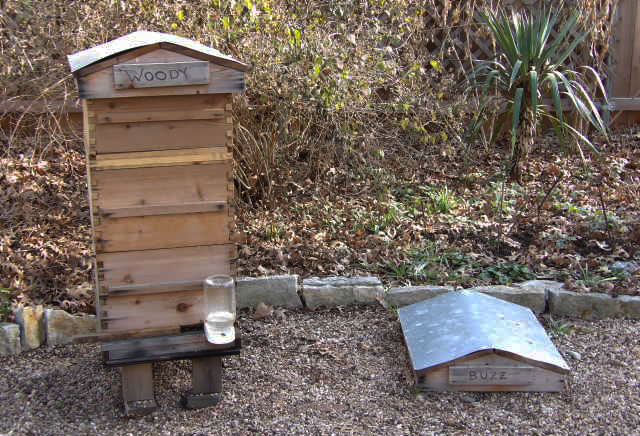 There’s not much blooming and it’s possible that the girls have used up their honey stores. It’s too cold for me to check the hives, so the easiest thing to do is to mix up some “nectar” and see if they go for it–and they have! Honeybees like their sugar! Well, I can’t criticize, I’m well-known for my sweet tooth, too. All situated, Woody is buzzing and Buzz is awaiting. Of course, Buzz has no buzzy bees, so she sits, in decorative mode for now: no bees, no sugar-water, but all nice and clean and ready for spring! Scar, our Warre hive, is also being fed. In my garden, there’s currently little flowering, thanks to the cold, dry winter boasting of several hard freezes. 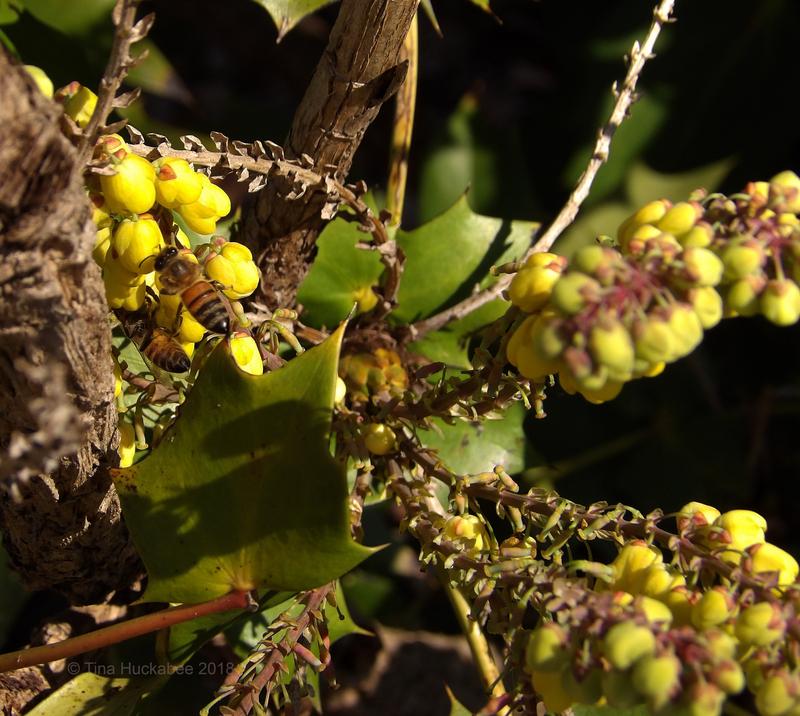 However, my three Leatherleaf mahonia, Mahonia bealei, are reliable winter bloomers and the bees are all over the cheery blooms as they open. How many bees can you count? Of course the bees also fly 3-4 miles for other nectar and pollen providers. The honeybees aren’t exactly bereft of blooms, but neither are there bunches of blooms for them to choose from. I’ve recently planted this green shrub in hopes of providing more winter sustenance for my honeys. It’s a Sweet Olive Tea tree, or Fragrant Tea Olive, Osmanthus fragrans. I’ve been angling for a winter blooming, non-invasive, and evergreen plant, and happened upon this specimen during a nursery sojourn. A non-native plant, the Sweet olive tree is primarily known and grown for its fragrant white blooms. It’s drought tolerant once established and also deer resistant, though (thankfully!) that’s not an issue for me. The Sweet olive tree is also something that isn’t particular about soil and will tolerate my clay and supposedly will bloom in sun, part-shade, and shade. The spot I chose in my garden for this large shrub/small tree receives winter sunshine, but is somewhat shady for the remainder of the growing season. I’m confident that it will prove a good source of nectar and pollen for my honeybees during winter. I also plan to add more mahonia to my garden, though I’ll probably choose other varieties than the Leatherleaf for the sake of diversity in plant material. Honeybee season is nigh, as is the season for native bees. The first native bees in my garden will be the Blue Orchard bees, who will emerge, buzzing and beautiful blue, from their pollen-packed holes (in bee hotels and masonry) sometime in the next few weeks. Bees are starting to happen! This entry was posted in Bee Hives, Beekeeping, Honeybee Hives, Osmanthus fragrans, Sweet Olive Tree, Uncategorized by Tina. Bookmark the permalink. That is so exciting! I can’t imagine having anything blooming this time of year, so I’m jealous. It sounds like you were very thorough with the cleaning, so Buzz will be back to healthy production soon. Good luck! We’re hoping for a good bee year! I think I cleaned up the mess fairly well and we’ll be as vigilent as we can be with the hives. We don’t have much blooming, though it’ll be toward the middle-end of February when our earliest spring blooming trees do their thing. Yippee!! Well done for cracking on with things so far ahead of time. Nice to see some bees too. I am looking forward to the next few weeks when the crocuses open en masse, for that is when I start to see a lot of bees in my garden. We’ve been warm this week, so they’re making themselves known again. Poor girls, though, not much to eat! I would love to grow crocuses, such beautiful flowers and I’m sure, welcomed in this deary time of year. Tina, I’m glad you cleaned all the crap from Buzz’s wax moths and disinfected and left her ready to house new bees in her new place. The photos are magnificent. Woody has been by his side and I’m glad he’s full of life, though with the help of sugar water like Sacart. 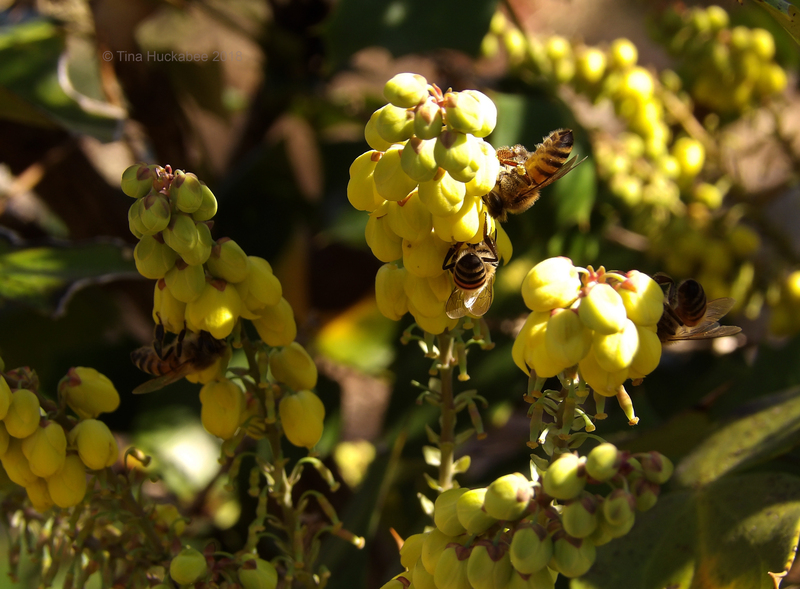 The 3 Mahonia beale i, they are beautiful and how the bees eat !. How many there are, I can not count them! 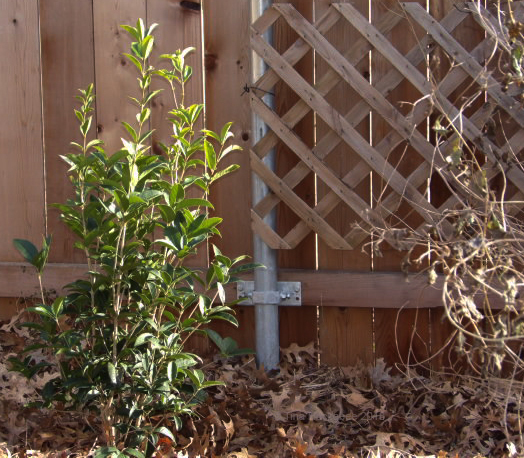 The Osmanthus fragans is a good choice for the bees when it settles and it begins to be made in the garden. Tina is a great post and you teach us many things. Thank you very much. Have a very good week. Greetings from Margarita. It was not an enjoyable chore, this cleaning out of Buzz, but necessary. I’m happy that there are a few things blooming right now, and there will be more toward the end of February. You have a good week, too–and thanks, Margarita! 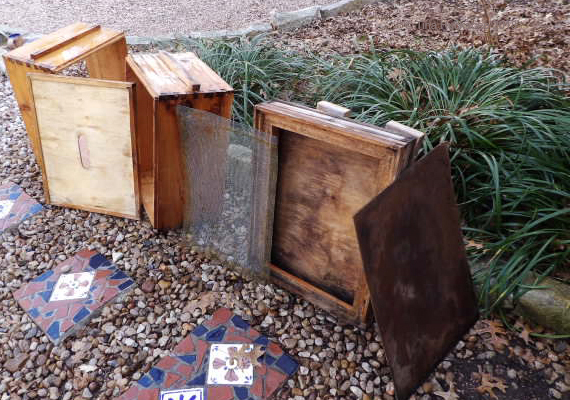 It occurs to me that beekeeping is like varnishing in one respect: preparation is everything. Without a properly prepared surface, the best varnisher in the world can’t make a coat smooth, and without a nice, clean hive, the bees happy and healthy lives may not be so assured. It is an interesting process, and I’ve wondered about the poor bees this time of year. I’ve seen one here and there, and there certainly aren’t many flowers for them. On the other hand, the buttercups are beginning to bloom, and just a few days after the ice and freeze, I found a flower I still can’t identify down at the wildlife refuge. It’s a composite, but I don’t think it’s a daisy or aster. It’s quite strange, with stems like blue-eyed grass. Once I get an ID, I’ll get it up on my blog. It did have three bees enjoying themselves at its polleny center! Like so many things in life, preparation is key! I started feeding my bees last week. There was some pollen gathering and once that starts, it begins the process of the queen laying eggs for spring–they need nectar and there’s not much blooming, so sugar water all around! I noticed this morning there were scads of bees bringing in pollen–no idea where they’re getting that from! Our early spring trees will be up and blooming in the next weeks. I look forward to your id of the flower. Congratulations on getting ahead of the game, and for getting rid of all that frass! Here’s to a year of healthy bees and beautiful nectar-rich flowers. Thanks, Sarah! And we certainly hope (and are planning for) a good year with bees!